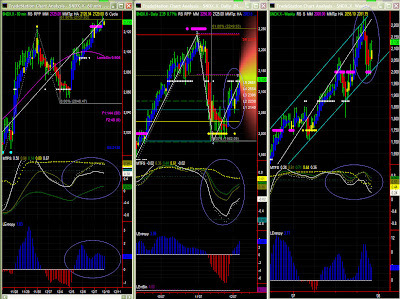 Market Direction: Upper bias, but volatility ahead. 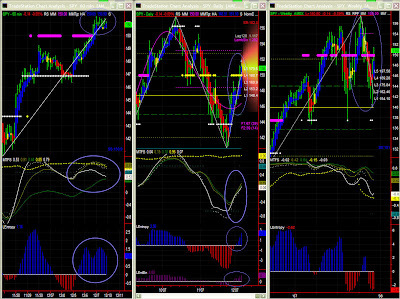 Read previous general comments on SPY and NDX. Patterns are different, but dynamics are correlated. Friday ended up as congested after boucing again on 781. We however have little energy to bring RUT much higher in the short term. Having said that, we should keep in mind a possible (longer term) Fib target of 795 now (with MM level at 797) that the 781 support seems confirmed. We have seen the recovery pattern actually materialising after RUT tested 750 again to bounce quickly to current levels. Again this type of recovery is seldom stable, and it would be surprising to see it going higher without some retracement, so there could be more volatility ahead. Swing turned up but it is far too early and the angle is too steep to consider this up swing stable. RUT is not out of the woods just yet. 60mins: Congestion to slight upper bias. Significance level coming down a bit, ahead of MTFS pattern completion. We would prefer a crossover in overbought territory, but looking at current line gradients, that may just not happen. Entropy is still positive so MTFS can still crawl slightly upward in the short term (even some congestion above 150 could be good enough). Daily: technically up, but behaviour on 151 must be watched very carefully. SPY now hit PR2 (61.8% Fib retracement) and hovered there. 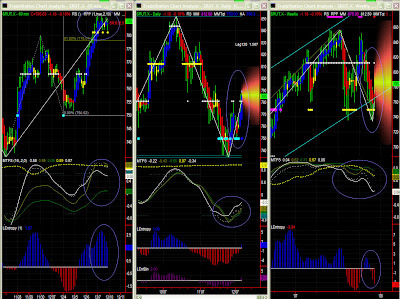 MTFS is however bullish now and current resistance level should technically be broken. We must however as always remain very cautious. Continuation of congestion or even a retracement are quite possible in the short term. We've had some congestion as expected (MM + Fib + undecisive MTFS). 60mins: congestion, but behaviour on key resistance level may cause some congestion. MTFS is again not showing a clear pattern, and we can only hope lines will join soon. In the meantime, one can only anticipate the continuation of the current congestion with an upper bias. Entropy is holding quite well, so a retracement is unlikely. Current level is a mix of Fib and MM levels. Possible longer term target remains [2185-2190]. Daily: Up, but reversal around 2125 remains possible while unlikely. We have the same scenario going on with a bit of a slowdown on the way to 2185 and 2250. There could be a little bit more congestion ahead, but no retracement in sight just yet. We'll have to watch Entropy potentially peaking though (LEntBin=4) over the next few days. NDX is half-way in its channel again. We don't have a blue bar yet though. Significance level has fallen to 44% which is understandable as current moves are way too fast for this time frame. One shall note that the swing indicator oscillates between UP and DN at current levels.